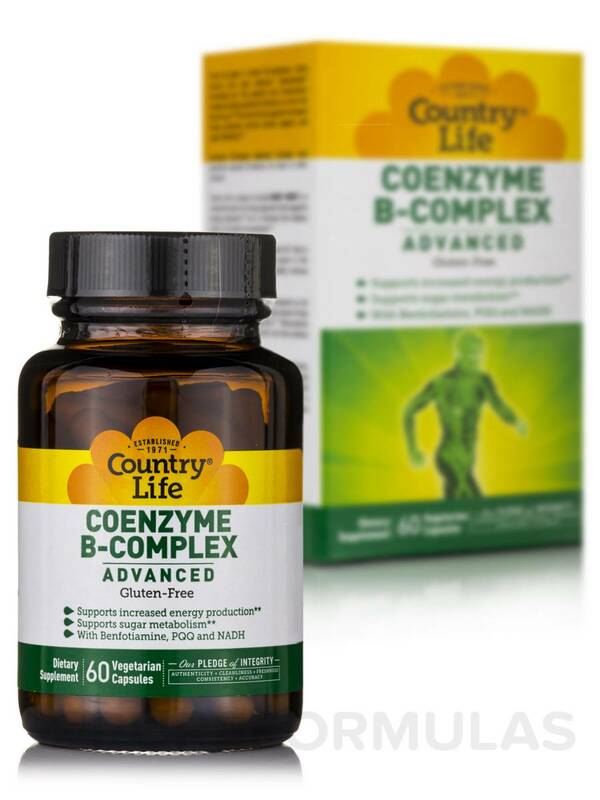 Coenzyme B-Complex Capsules from Country Life® may provide you with the benefits of essential B vitamins. The body needs various nutrients to support different aspects of health. 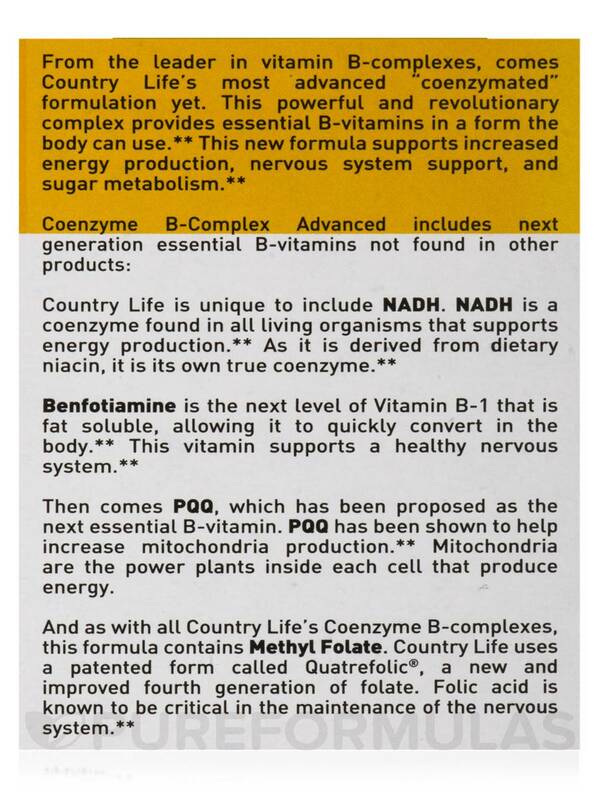 All the B vitamins together make up the B-complex group. 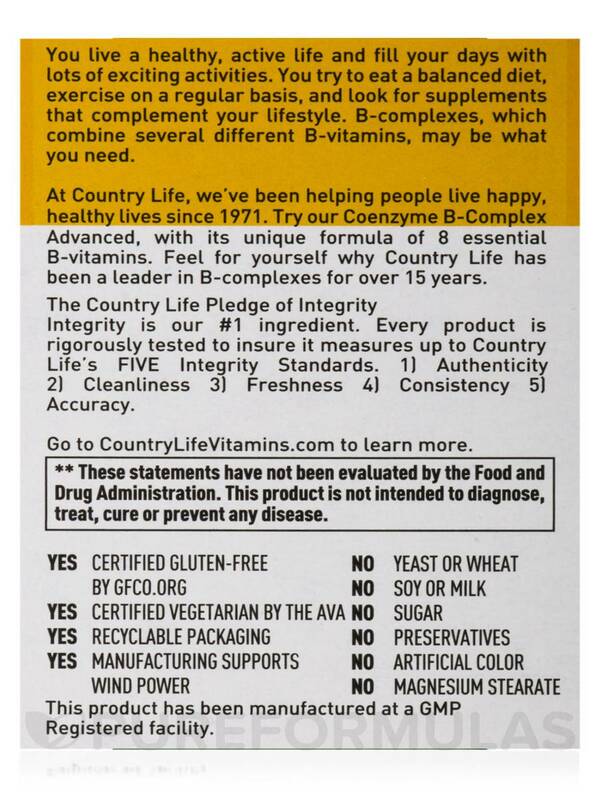 This supplement from Country Life® provides B vitamins in a form that is easy to assimilate. This specially made formula could support an increase in the production of energy‚ support the nervous system‚ and the metabolism of sugar. 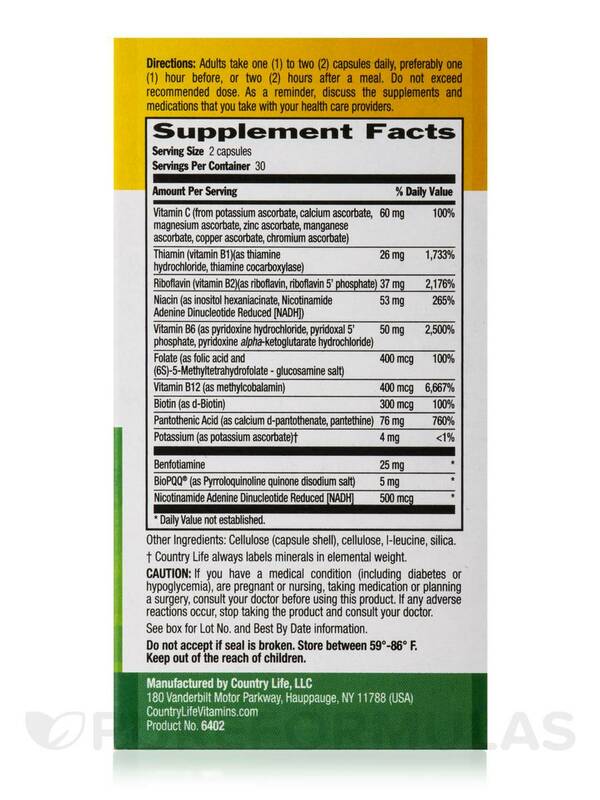 Vitamin B-1 helps the body make new cells‚ while B-2 can provide antioxidant aid. Vitamin B-3 might support a heart healthy lifestyle and B-5 could help break down fats and carbohydrates. The supplement also contains Pyrroloquinoline quinone (PQQ)‚ which might increase the production of mitochondria‚ the power plants inside every cell in the body. 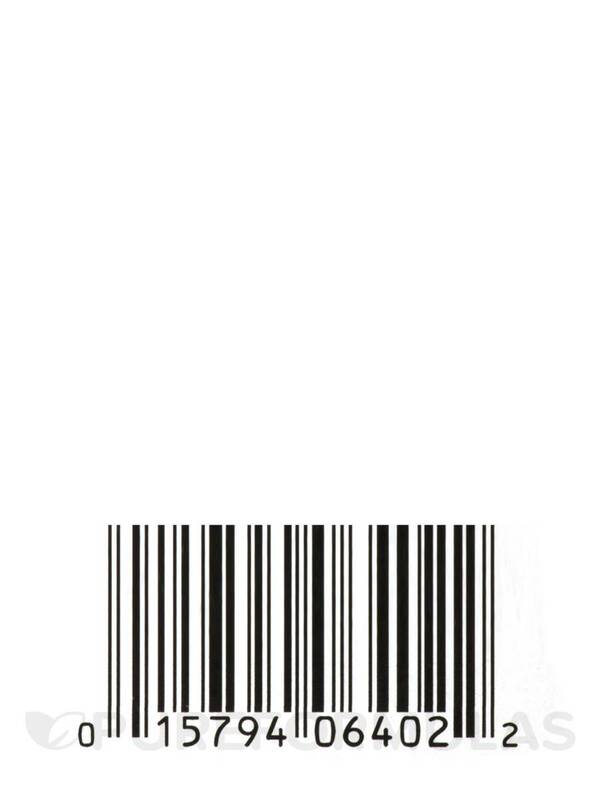 Nicotinamide Adenine Dinucleotide Reduced [NADH] is a chemical that occurs naturally in the body and might play a role in the production of energy. The supplement also contains vitamin C‚ the immune-boosting vitamin that can also provide strong antioxidant benefits to the cells and DNA. 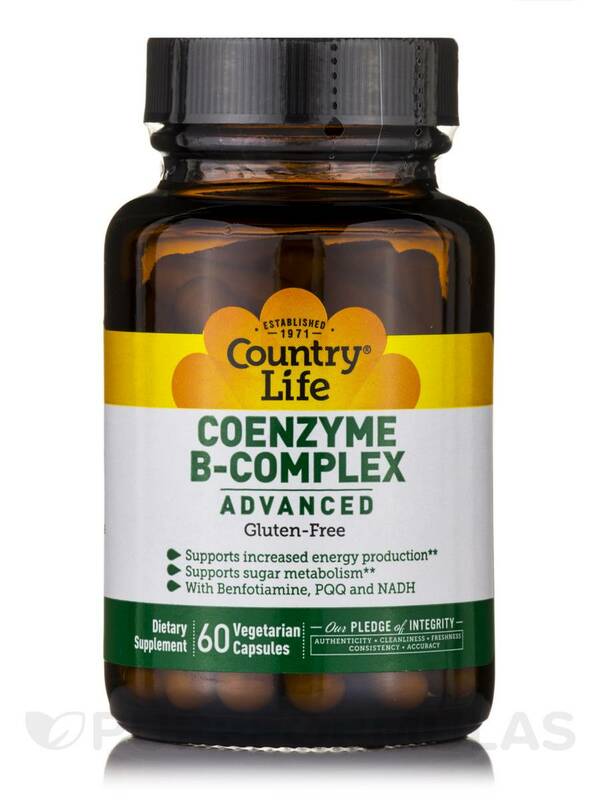 Coenzyme B-Complex Capsules from Country Life® bring you one of the most advanced coenzymated B-complex formulas available today. 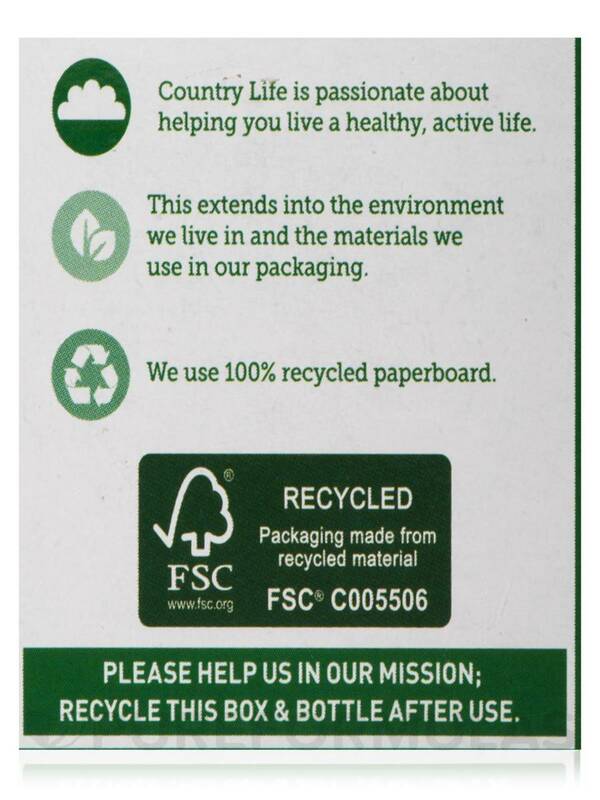 Other Ingredients: Cellulose (capsule shell)‚ cellulose‚ l-leucine‚ silica. 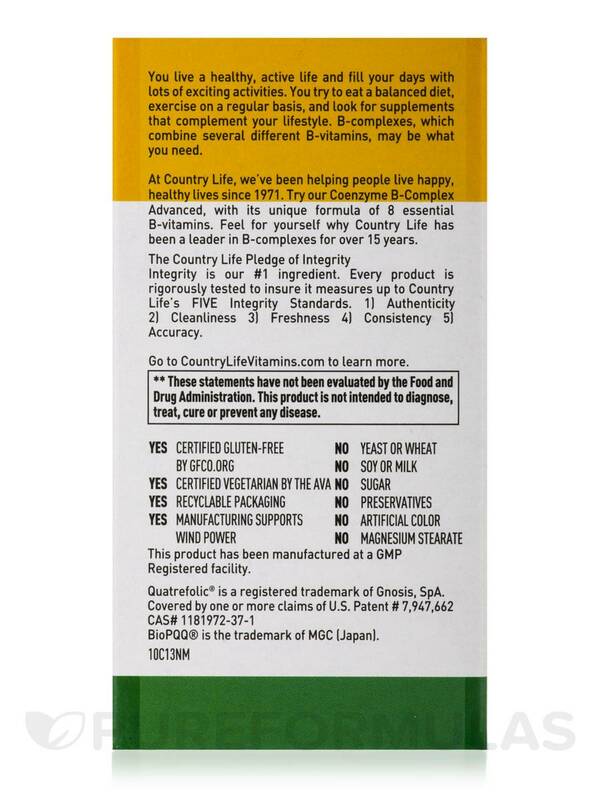 No yeast‚ wheat‚ soy‚ milk‚ sugar‚ preservatives‚ artificial colors‚ or magnesium stearate. 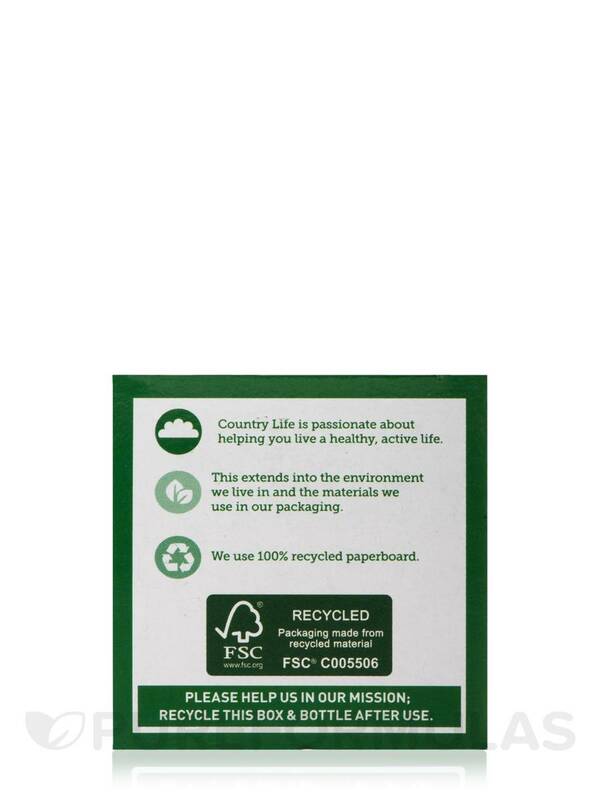 Adults take one (1) to two (2) capsules daily‚ preferably one (1) hour before‚ or after a meal. Do not exceed recommended dose. As a reminder‚ discuss the supplements and medications‚ you take with your health care provider. If you have a medical condition (including diabetes or hyploglycemia)‚ are pregnant or nursing‚ taking medication or planning a surgery‚ consult your doctor before using this product. If any adverse reactions occur‚ stop taking the product and consult your doctor. 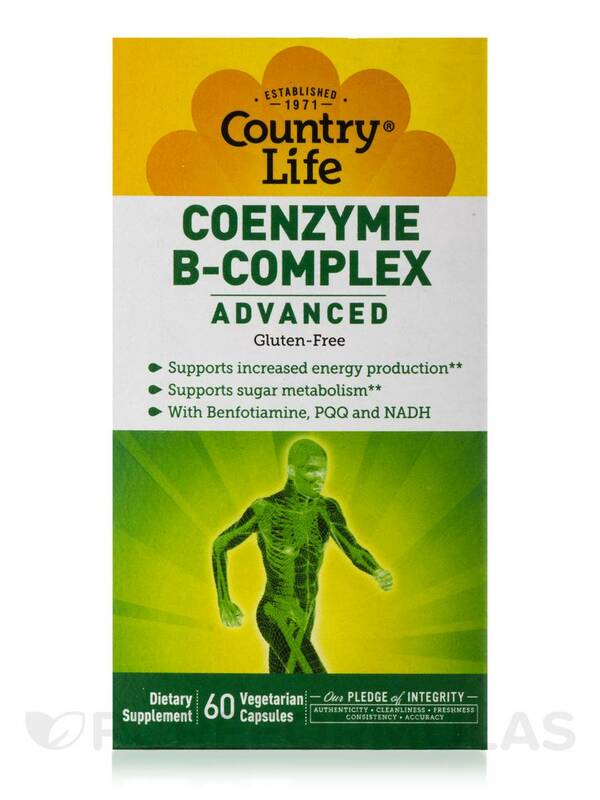 Coenzyme B Complex Advanced by Country Life is the best B I have found. Since I have multiple sensitivities and methylation issues I have to be careful with all foods & supplements. This B-Complex has the best sources and additional ingredients that support methylation. 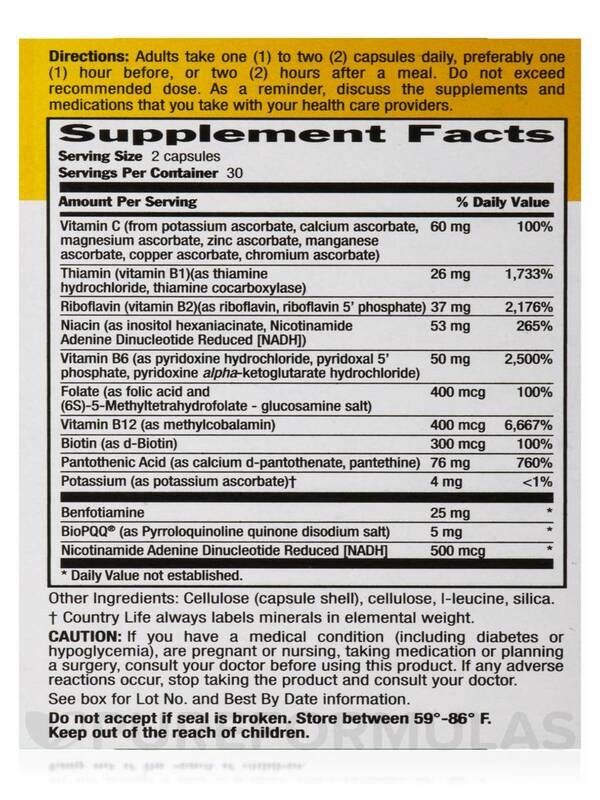 Though the cost may seem higher, the additional nutrients are equal to 4 high cost products. 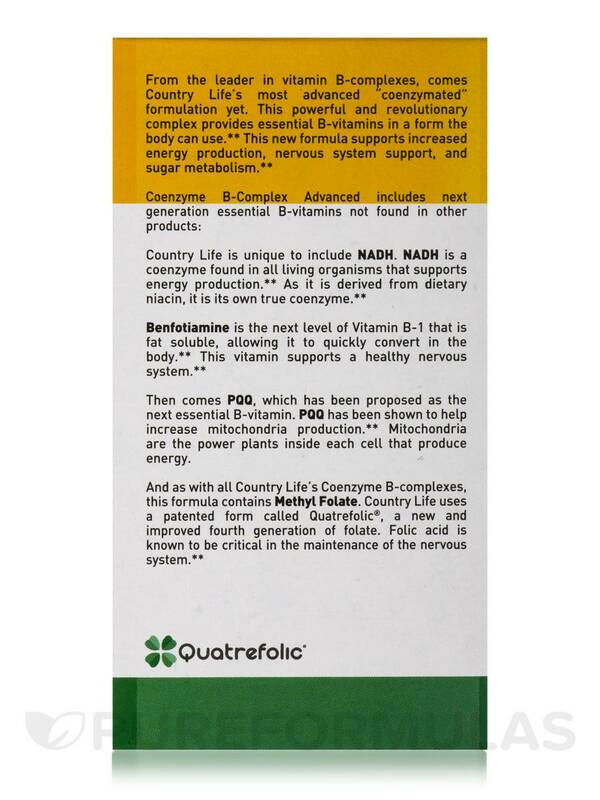 I love the form of folate in this product ...it is easily absorbed. It increases energy, balances blood sugar as well as increases mental & emotional stability.The additional PQQ, NADH & Benfotiamine are a huge plus and would be a great additional expense separately. I have recommended this to many friends & family.